Debate is great and there are many topics in which I would be greatly supportive of the conversation focusing on men’s voices and involving two male perspectives. Like the rhetoric around prostate cancer screening. You know the idea – some variation of “man up, get checked.” I know what these ads are trying to do, save men’s lives, but personally, I dislike the idea of turning the fear of a loss of hegemonic masculinity into a health incentive. It’s also super cissexist. How we construct masculinity in public discourse needs to be discussed and reimagined. So that, for instance, is a topic I’d love to hear more about from men. Whether or not scholarships designated to support woman identified students is “sexist” towards men is not a topic I’m eager to see “debated,” let alone by two men. There are many great web articles that can more thoroughly explain why “reverse sexism,” like “reverse racism,” is not a thing. It has to do with power dynamics. Sexism requires prejudice or discrimination + power. 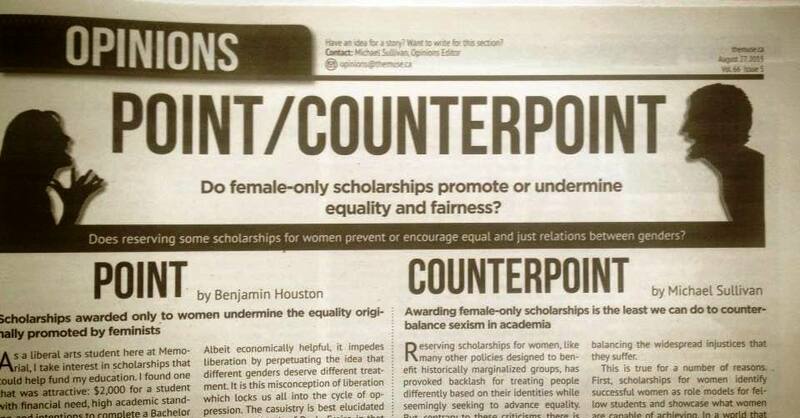 So I was confused to see a “Point/Counterpoint” opinion article in the August 27 issue of the Muse newspaper, titled “Do female-only scholarships promote or undermine equality and fairness? Does reserving some scholarships for women prevent or encourage equal and just relations between genders?” argued by two men. And I’m not assuming their gender identities based on their names – each writer identifies themselves as male in their writing. There is never a valid reason to put forth a discussion or debate around a topic that specifically impacts women – and specifically invokes theories of what is or isn’t good for women, as a group, and good for feminism, as a movement – and not involve women. Even constructing this topic as something to be debated is evidence of shortsightedness around the topic and the advocacy that underpins equity-oriented action and policies, but to pursue the debate in a student newspaper and not ensure to find at least one woman writer is inherently flawed. Maybe there were no women, working or volunteering for the paper, that were interested or came forward with gusto. But that doesn’t mean someone didn’t want to write it. The challenges of being a feminist, an outspoken feminist, in public and online are many. Ignoring the barriers that could make a woman disinclined or even afraid to step up to an argument involving feminism only perpetuates the problem. It’s like when we see committees or panels full of men and don’t question them. Nothing strange here! Men as experts, authorities, respected leaders – normalized. It doesn’t mean there aren’t women who are equally (or more!) qualified to participate. We need to continually remember that the system that normalizes male participation as unnoticed needs to be challenged. So, for whatever reason, there are no female voices in this published debate. Not even, say, one tackling one side or the other. The “counterpoint” author does a great job explaining the many valid reasons why we should designate certain supports for marginalized groups, particularly around access to post-secondary education and further career advancement. He recognizes and explains how regardless of perceived inherent aptitude between different genders, people of different genders may be encouraged, supported, and promoted differently. He even contextualizes practical, daily life barriers and challenges that can adversely impact women’s actual experiences in post-secondary classrooms and on campuses. Have you asked any women what it’s like to be the only woman in a given trades program, for example? While this writer does a really nice job, it wasn’t really his place. Since his points are good and appreciated, though, let’s talk about the argument against scholarships designated for women students. The writer states “this scholarship is undeniably sexist.” No it’s not – please familiarize yourself with the definition of the term, the role of male supremacy in shaping society, and the necessity of oppressive power dynamics to make something sexist. Nope. I’m a female student who, for my Master of Gender Studies degree, received a $2,000 scholarship earmarked for women in the program. It didn’t subvert my self-respect. And while this particular scholarship was specific to my individual program, in which there are typically more women studying, it doesn’t make me feel like I only received it because men weren’t eligible. Why? Because it has nothing to do with men! I’m also really uncomfortable with the term able-bodied here. Perhaps he meant “capable” humans. I have no idea what able-bodiedness has to do with feeling deserving of a scholarship. Women, like men, in post-secondary may face a variety of intersecting challenges that further compound the need for equity and support. Further, my femaleness or femininity is not a disability. It’s exceptionally patronizing for a man to suggest women supporting scholarships might undermine our collective womanly self-respect. My self-respect remains entirely intact, but thanks for your concern. The writer also contextualizes his interest in the topic through the lens of his own perceived disadvantage, being a male student interested in a scholarship that is earmarked for female students. The worst, basest argument against feminism would have to be “men will have to give up their power” or, a variation, “efforts to help women gain equity and the advantages men have long taken for granted will hurt me, as a man.” Key terms here would have to be male privilege and entitlement. You haven’t lost anything; something just exists that is actually foregrounding the educational needs of women. I care about this as a woman in post-secondary who has benefited from scholarships, specifically ones that have been designated for people facing challenges like “financial need” or “being a woman.” I also care about it having been a volunteer or employee of the Muse for four years several years ago. 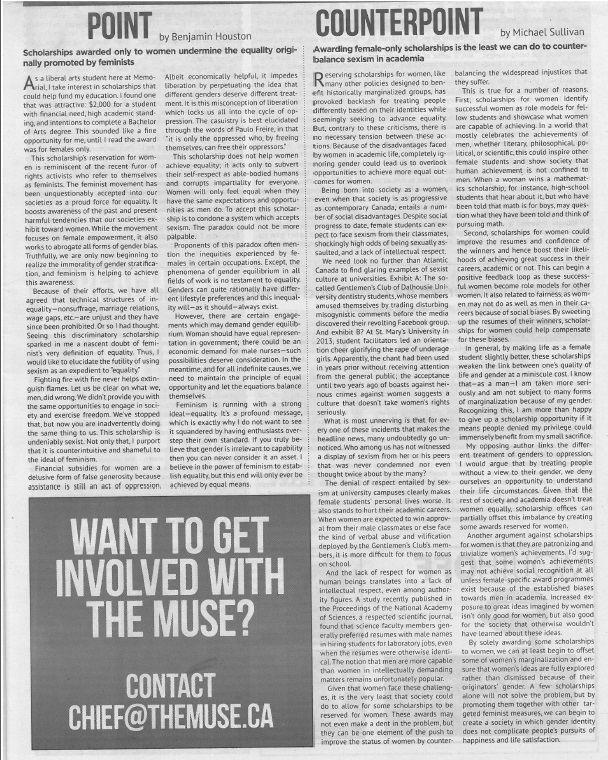 A student newspaper has a responsibility to not just promote and discuss topics of importance to women, but to promote and encourage, rather than further stifle, women’s representation in their coverage. It’s also really key to involve the voices of people with actual stakes in the discussion.